When implementing a PTT app, a strategic change management plan needs to be considered. This is especially critical when driving change among a more mature workforce. Someone who has been working a certain way for 20 years will have a hard time adapting to new processes and technology. The first step is analyzing the types of end users based on communication need and user skillset. From there user profiles can be configured accordingly with the ideal permissioned features and functionality. Allocating features inappropriately could lead to unnecessary user confusion, slower app adoption and even distraction from the work at hand. To drive a differentiated approach to the end user perspective, end users need to be segmented into different groups. The segmentation should be guided by the different needs for communication. Often this is done by job title or level in the hierarchy within the organization which might lead to giving the wrong people too many communication possibilities or too little. With who should this person communicate with on a regular basis? Would these people be the same type of end user? Can these people be categorized into one group? How many groups or contacts would someone communicate to on a regular basis? How mobile phone/technology savvy is the user? It is possible that within a team there are different end user types based on their skillset. If you are looking at not only replacing two-way radio communication but also expanding it to more users as the cost per user is significantly lower than for land mobile radios (LMR), you will probably add more user types and will be able to drive a better segmentation of users than you did through radio traffic. 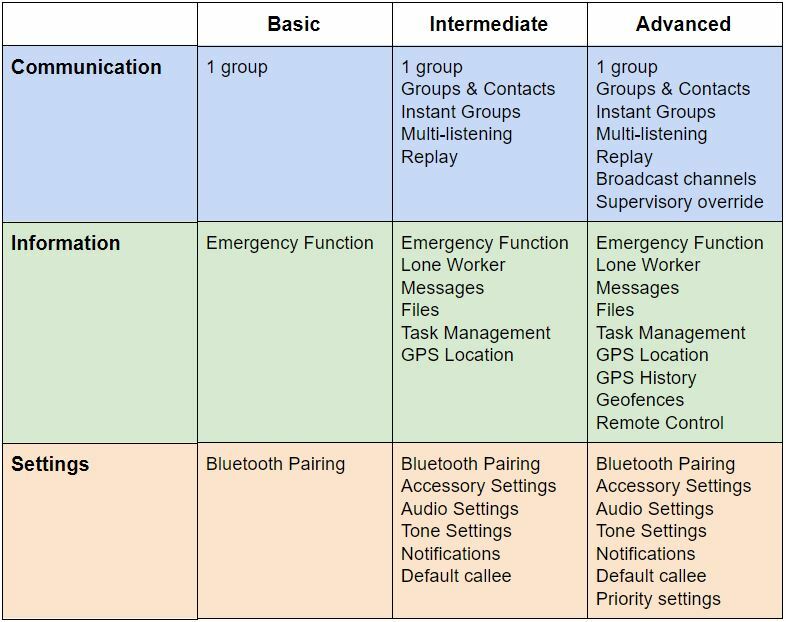 If you are looking to simply replace two-way radio communication, you can stay with the existing groups/channels that you used for LMR. Once you have segmented the end user types, you need to clarify what access and functionality needs to be granted to each group. Does the PTT app support the creation of different end user profiles or does it simply provide everything for everyone? Most companies want to control what and to who users can communicate and what data and setting changes can be made by end users. One very important thing that many PTT solution decision makers and PTT solution providers forget, is that for most end user groups, it is not their job to facilitate PTT communication. Exceptions include dispatchers whose focus is communicating with end users. Increased communication functionality can be more beneficial depending on the skillset of the workforce. With millennials who are mobile phone application savvy, gaining a bigger share in our workforce, there are fewer problems. However, with a workforce that has used only a PTT button to communicate, a PTT application with too many functions can be highly confusing taking the attention away from the actual work which can cause reduced productivity or even accidents. Depending on the end user types, the profiles should be configured. This could look like the table below. While the Basic profile provides more or less a substitute to very simple one channel radio communication, the Intermediate profile already offers additional features that clearly differentiates PTT over LTE from LMR communication. The Advanced profile is something that should be reserved for supervisors and admins and there could possibly even be a distinction between the two groups. For more guidance on understanding the user’s perspective, download the complete Whitepaper for free!